The Shetland Plate is a tectonic microplate bordered by the present-day Antarctic and Scotia Plates. It can be modelled as an approximate rectangle with a 3:1 aspect ratio, where its width is about 200 km. However, its tectonic boundaries are much more complex. Fig. 1: A satellite image of the Shetland Plate with an overlay of the plate boundaries indicated. Subduction is indicated in blue, spreading by yellow, dextral transpression by pink, and sinistral transpression by mauve. 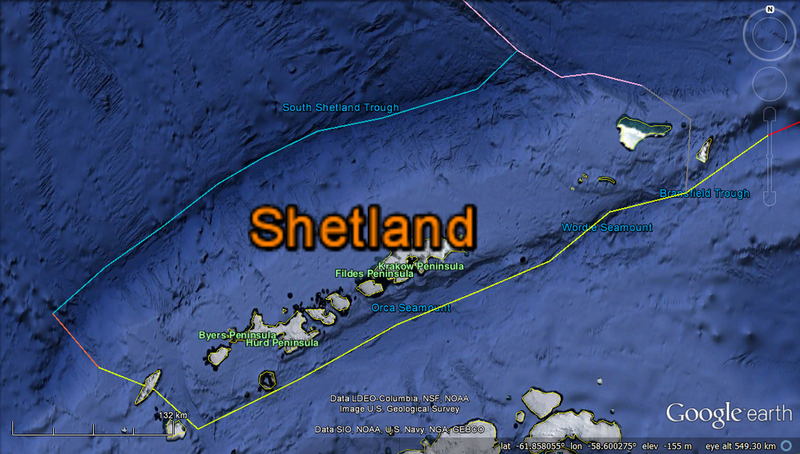 The South Shetland Islands lie along the Bransfield Basin. The southernmost ring-shaped structure is Deception Island, a ring caldera. The plate is bounded by many complicated features: the South Shetland Trough and the Bransfield Strait to the NW and the SE, respectively, the sinistral transpressional Shackleton Fracture Zone (SFZ) and sinistral transtentional Scotia Ridge Transform to the NE, and the Hero Fracture Zone (HFZ) in the SW. The SFZ and HFZ continue NW into the Antarctic Plate, where they act as boundaries along two edges of an inactive ancient tectonic plate known as the Phoenix Plate (Galindo-Zaldívar, 2006), one end of which was undergoing spreading and other end of which was being subducted by the Antarctic Plate until about 4 Mya (the South Shetland Trough) (Jin et al., 2009). At 3.3 Mya, this subducted plate (at the time and currently considered a part of the Antarctic Plate due to its inactivity) underwent roll-back, forming a back-arc basin, the Bransfield Strait, and also resulting in the reactivation of what were thrust faults prior to 3.3 Mya as currently-active normal faults (Jin et al., 2009). Faults in Elephant Island, located at the NE-most end of the Shetland Plate, agree with this finding (López-Martínez et al., 2006; Galindo-Zaldívar, 2006). The Bransfield Strait is estimated to be a maximum of 1.4 Ma old (Martí, 2013). Of interest is also the fact that the Shetland Plate is said to be of continental origin, in spite of being submerged (López-Martínez et al., 2006). The general consensus is that the South Shetland Trough is currently active at a low level in that, as a result of rifting at the Bransfield Strait, subduction of the Antarctic Plate by the Shetland Plate is happening (Jin et al., 2009; Galindo-Zaldívar, 2006; López-Martínez et al., 2006). The aforementioned South Shetland Islands are also a part of this back-arc magmatic system; they formed as a result of the upwelling of acidic, water-rich magmas created when the subducted edge of the Antarctic Plate melted. This chain is not a result of hot-spot volcanism (the islands are estimated to have formed at the same time), but instead an example of oceanic arc magmatism and likely possesses a tholeiitic composition (Birkenmajer et al., 1990). Deception Island is a caldera along the Bransfield Basin that collapsed after a very large-volume output of lava that triggered normal faulting along pre-existing faults unrelated to any volcanic event (Martí, 2013). It was previously thought to be a classic ring-fault caldera, where concentric normal fault formation is a direct result of a drop in pressure in a magma chamber due to eruption, but opinion on this has since changed being that the orientations of normal faults in the caldera can be explained by the extension of the Bransfield Strait (Martí, 2013). Fig. 3: A stage-by-stage breakdown of the collapse of Deception Island (Martí, 2013). The coloured lines in a) are faults dating to prior to volcanic activity. Note that a) is a birds-eye view image whereas b) is as if viewed from an oblique angle overground. An interesting story: the first man to set foot on Elephant Island was Perce Blackborow, a 19 year-old stowaway on Ernest Shackleton's 1914 voyage on the Endurance. Because he was unable to stand—he developed gangrene in his toes due to extensive frostbite as a result of inexperience in cold weather, leather boots, and the destruction of the Endurance—he was ceremoniously thrown overboard to accept to honour of being the first man on Elephant Island, and then promptly dragged ashore where a medical tent was set up and surgery on his left foot commenced. Birkenmajer, K., Guterch, A., Grad, M., Janik, T., Perchuc, E.,1990. Lithospheric transect Antarctic Peninsula-South Shetland Islands, West Antarctica. Polish Polar Research, 11 (3-4), 241-258. Galindo-Zaldívar, J., Maestro, A., López-Martínez, J., de Galdeano, C. S., 2006. Elephant Island Recent Tectonics in the Framework of the Scotia-Antarctic-South Shetland Block Triple Junction (NE Antarctic Peninsula). Antarctica: Contributions in Global Earth Sciences. Springer. Berlin, Germany, pp. 272-276. Gonzalés-Casado, J. M., Robles, J. L. S., López-Martínez, J., 2000. Bansfield Basin, Antarctic Peninsula: Not a normal backarc basin. Geology, 28 (11), 1043-1046. Jin, Y.K., Lee J., Hong, J.K., Nam, S. H., 2009. Is subduction ongoing in the South Shetland Trench, Antarctic Peninsula? : new constraints from crustal structures of outer trench wall. Geosciences Journal, 13 (1), 59-67. Livermore, R., Nankivell, A., Eagles G., Morris P., 2005. Paleogene Opening of Drake Passage. Earth and Planetary Science Letters, 36 (1-2), 459-470. López-Martínez, J., Trouw, R. A. J., Galindo-Zaldívar, J., Maestro, A., Simões, L.S. A., Medeiros, F.F., Trouw, C.C., 2006. Tectonics and Geomorphology of Elephant Island, South Shetland Islands. Antarctica: Contributions in Global Earth Sciences. Springer. Berlin, Germany, pp. 277-281. Martí, J., Geyer, A., Aguirre-Diaz, G., 2013. Origin and evolution of the Deception Island caldera (South Shetland Islands, Antarctica). Bulletin of Volcanology, 75 (6).